A close look at the biology and behavior of jellyfish combined with a personal history of the author, a former ocean scientist who was pulled back to the sea by these enigmatic creatures. As science writer Berwald notes, details about jellyfish—whose species number in the hundreds—are scant in comparison with what is known about other marine animals despite the fact that they have been on Earth for at least 500 million years. Because they reproduce quickly and can adapt to different environments, they’re notorious for disrupting ocean ecosystems and devastating fishing economies. For beachgoers, they are often just nuisances with a painful sting. But the further the author dives into her research, the more she suspects that jellyfish behavior may provide clues about how the Earth’s changing climate is affecting ocean life. In addition, jellies have sophisticated propulsion systems and collagen-based bodies that may guide bioengineers in developing new products. In this appealing combination of solid science writing, investigative journalism, and memoir, Berwald chronicles her travels around the globe interviewing leading jellyfish experts and viewing all types of jellies in aquariums and native habitats. What the author discovered is that jellyfish science is growing as it becomes more apparent that the animals are a robust source of information about the ocean’s conditions as well as many other facets of the natural world. 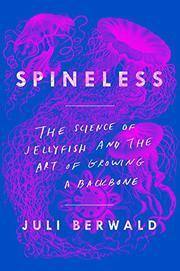 After years of research, Berwald is convinced that “to research jellyfish is not just to look at a creature unfamiliar and bizarre to most, but to study the planet and our place in it.” While writing this lucid, eye-opening book, the author discovered that her place was, in part, inextricably entangled with jellyfish. In this lovely exploration of the mysterious jellyfish, Berwald both entrances and sounds a warning: pay attention to the messages sent by ocean life, and act to protect their environment, and ours. As an avid reader and aspiring author, Juli Berwald noted what sold when it came to nonfiction science books: authoritative, impersonal, exactly 10 chapters, and typically written by men.